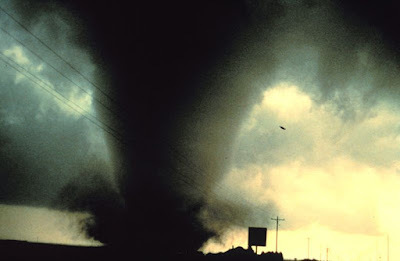 In the wake of the devastating tornado that rippled through Joplin, Missouri on Sunday - killing some 116 people - I was moved to consider the fact that I, during my 29 years, have yet to witness a tornado, hailing (excuse the pun) as I do from England. The only major British tornado-related incident I can recall occurred in the city of Birmingham in 2005. It was one of the strongest tornadoes recorded in the country in 30 years and, as I recall, ripped through a housing estate, leaving multiple terraced buildings in its wake. Luckily, no residents were home at the time of the storm and, in fact, no fatalities were reported that day. Sadly, the same cannot be said for America in 2011. In the first half of the year alone, over 500 people have been killed during tornado storms - most notably in Alabama and surrounding states - making it the deadliest year for tornadoes in America since 1953. Indeed, as I write this post, local news reports continue to respond to tornado warnings that have been issued for various counties here in Indiana. Given that my house is by no means the sturdiest of structures, I can only hope that the downstairs bathroom - as small as it is - is strong enough to protect two humans and an equal amount of cats throughout the night. Whether a tornado materializes or not, I foresee numerous trips to said bathroom until, that is, the storm warnings expire. Like what you're reading? Join me on Facebook by clicking here.